An evening of Cocktails & Dancing awaits at our Cocktail Party! We will be joined by talented mixologists from The Cocktail Social who have developed a special cocktail menu for the evening. On arrival you will receive a Prosecco cocktail & canapés to enjoy (included with your ticket) whilst you peruse our cocktail menu. Our DJ will be playing a great mix of current and classic floor fillers throughout the evening with dancing positively encouraged! 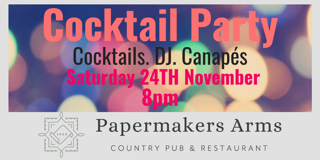 In addition the full Papermakers Arms bar will be available too. Order online CLICK HERE or pop in to purchase.